A senior man and his disabled wife sitting on bed, giving a foot massage. A senior man and his sad disabled wife sitting on bed, giving a foot massage. slow motion. A Senior Man And His Disabled Wife Sitting On Bed, Giving A Foot Massage. A senior man and his sad disabled wife sitting on bed, giving a foot massage. Slow motion. A senior man and his sad disabled wife sitting on bed, giving a foot massage. A senior couple sitting on bed at home, a man giving medication to his ill wife. A senior couple sitting on bed at home, a man giving medication to his ill wife. Slow motion. 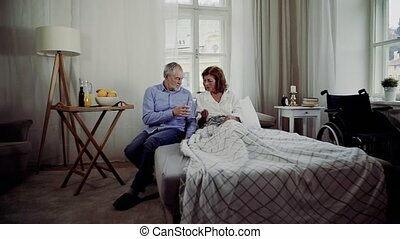 A senior couple sitting on bed at home, a man giving a glass of water to his ill wife. Slow motion. 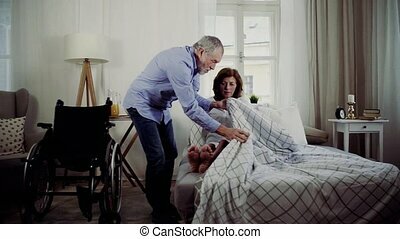 A senior man putting his disabled wife in bed, a husband helping his ill wife. Slow motion. A senior couple at the table at home, a man helping his disabled wife. A senior couple in the morning at home, a man helping his disabled wife. Slow motion. 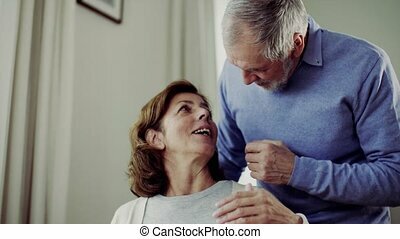 A close-up of loving and caring senior man talking to his disabled wife at home. Slow motion. A senior couple with tablet at home, a husband and his wife sitting on bed, spending time together. A senior couple with tablet at home, a husband and his wife sitting on bed, spending time together. Slow motion.